The project was a combined effort between architects Kevin Roche and John Dinkeloo and landscape architect Dan Kiley. The ground level landscaping actually occupies a 13-foot grade change. This means it is a tiered garden with steps leading to a pool. Planters lining the interior glass at several of the higher levels allows the plant life to ascend along with the building as you look up towards the high skylights. The glass offices within are oriented towards this expansive atrium, providing an indoor park for the 12 stories of glass offices facing it and for passers by wandering in. 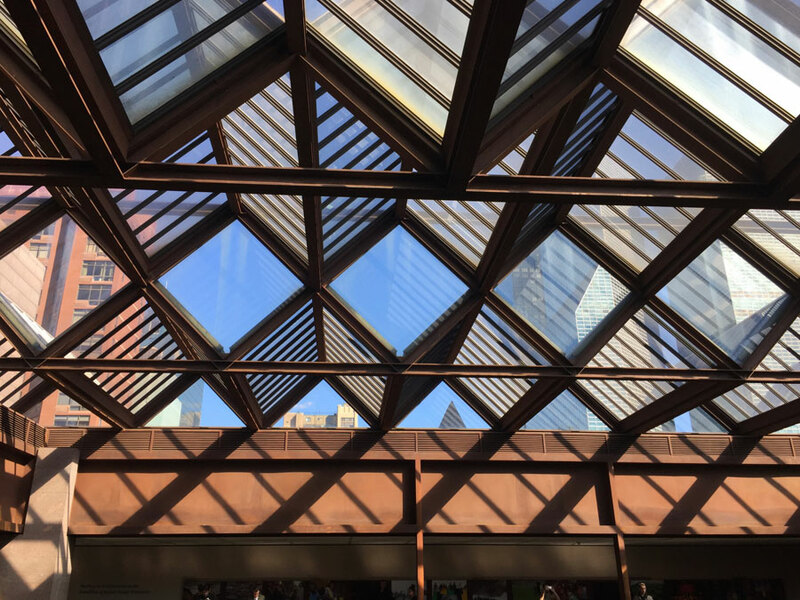 The prismatic glass skylight keeps the atrium light. Source. The transparency and indoor-outdoor connection is all the best of Midcentury Modern style, and the building’s design also has an equalizing effect. Since windows do not have to face only out to the street and Tudor City Park outside, but also the lush atrium within, it means you don’t need a corner office to enjoy a view and light-filled workspace. The fishbowl effect also builds in transparency—you can see into the conference room and offices, spaces that are usually walled off. The building is now a New York City Landmark. It’s a great place to take refuge from the winter cold and gawk at pristine architecture and green subtropical plants.